Bill Scott has been an active skydiver for 37 years, but you’d never know it from his razor-sharp wit and charming, playful manner. 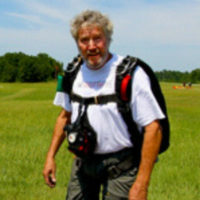 Quick with a joke and a jack of all trades, Bill is a great guy who truly, madly, deeply loves the sport of skydiving. Because he’s at the heart of Skydive Monroe, it’s that passion that drives the dropzone–and puts a smile on the face of so many jumpers. More about Bill can be found in our Meet the Skydive Monroe’s Owner blog post.